I hope you had a great weekend and for anyone running Boston today- GOOD LUCK! You've trained so hard, running through crazy conditions, getting up when the rest of the world is sleeping- trust your training and enjoy the experience. 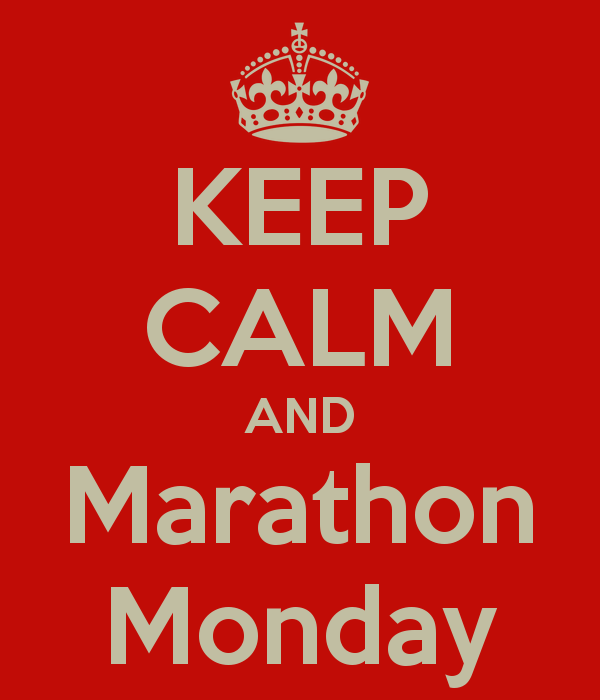 I honestly cannot wait until the day comes where I get to run Boston, but until then I will be looking forward to watching Marathon Monday on live t.v.! The wheelchair division begins at 6:40am MST (8:40am EST) and the elite women kick off at 7:32am MST (9:32am). You can read more about all of the live schedule and where you can watch it here. While the weather looks like a drastic difference from last years scorching heat, 2012 was actually the hottest Boston Marathon on record with temperatures hitting 90*! It's also crazy to think that Marathon Monday is celebrated as a holiday in not only Massachusetts, but also Maine where Patriots Day celebrates the start of the Revolutionary War. Being a transplant New Englander, I feel like I should still probably celebrate Marathon Monday even though I'm currently in CO ; ) Which is why I'll be sporting my 'marathoner' sweatshirt from Sarah Marie Design Studios. It also just so happens gets me pretty excited for my next 26.2- on SATURDAY! I remember feeling so inspired last year following all of the Boston Marathon coverage and I'm hoping to carry these feelings into my race in Salt Lake City. Is anyone else planning to run the SLC marathon?! I also LOVED following the Hyland's Boston Marathon team last year and this year, they chose 17 teachers to be a part of their team to run Boston (celebrating the races' theme this year, "year of service"). What an amazing experience to be selected to be a part of! The elite field for women at Boston is DEEP- Shalane Flanagan, Molly Huddle, Jordyn Hasay, Desiree Linden, Deena Kastor being among the top Americans! I feel like this is the year that we will once again experience an American win the race, but it is so difficult to say which one! I'm such a fan of Shalane and think it would be so exciting to watch her win Boston (especially after not being able to run it last year due to injury), but Molly Huddle has also had some really exciting breakthrough performances, including her new American record in the Half Marathon in January! Who do you think will win Boston?! Anyone in Boston running or spectating? --> Stay warm and run/ spectate with your heart!